Manufactured in Allemagne from Circa 1990 until Circa 1996. 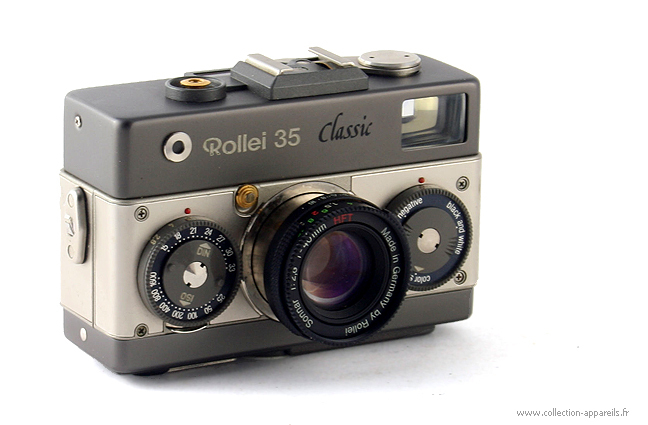 This version of Rollei's famous "35" was assembled after a return to Germany from long-time expatriate manufacturing in Singapore. The production of the range was then limited to some prestigious models with luxurious finish. The standard Model 35 Classic Titanium has only been manufactured with 6480 copies. The body is dressed in platinum, the top and bottom covers are titanium plated and the trigger and bolt of the gold lens! The device was sold in a silver color box also containing the dedicated flash 20 REB and a leather case.